The CTSturbo head spacer gasket for the MK4 R32 3.2L 24V VR6 motor. Lowers the compression to 9:1. Comes with gaskets included. 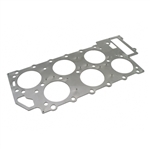 CTSturbo head spacer gasket for the MKIII 12V VR6 and MKIV 12V VR6 motor. Lowers the compression to 9:1. Comes with gaskets included. The CTSturbo head spacer gasket for the MKIV 24V VR6 motor. Lowers the compression to 9:1. Comes with gaskets included.